We’d love your help. Let us know what’s wrong with this preview of Over Easy by Pamela Ford. See Alternate Cover Edition HERE. Diamonds, dogs and dating. What could possibly go wrong? Dog groomer Allie Parker has the worst luck meeting men. So when she discovers that hotel continental breakfast is filled with eligible bachelors, she squeezes into her sister’s high-class clothes and pretends to be on a business trip. Before she’s taken her last bite of syrup-laden wa See Alternate Cover Edition HERE. Dog groomer Allie Parker has the worst luck meeting men. So when she discovers that hotel continental breakfast is filled with eligible bachelors, she squeezes into her sister’s high-class clothes and pretends to be on a business trip. Before she’s taken her last bite of syrup-laden waffle, she’s met the perfect guy. That’s when everything starts to fall apart. The new man disappears, leaving behind a briefcase full of diamonds. A menacing stranger comes to claim it. And Allie is forced to go on the run. But as she scrambles to find the truth so she can return to her regular life, can fate be about to deliver the happily ever after she’s always wanted? I’d like to thank i Over Easy is book one in The Continental Breakfast Club series. This is the story of three best friends who one day come up with this great idea to find men at a hotel during continental breakfast. I laughed so hard during this book. I absolutely loved Ford’s style of writing, and I just loved Allie. This was such a cute and delightful read. Fast-paced and funny, this is a great summer read that you can enjoy in one sitting. I definitely recommend this light-hearted chick-lit. The characters were very real and believable. I felt like I was spending time with a girlfriend. The writing was very easy to follow. It flowed very easily. The conversations between characters was to the point and not drawn out. A cute, silly,adventure/mystery type of novel with a little romance thrown in. This book was a lot of fun to read. It grabbed my attention from the beginning and kept me interested the whole way through. It was a fast-paced, easy to read novel. I flew through this book. * I received a copy of this book in return for an honest review. I have to say this read is in a league of its own. So many twists and surprises keep you in stitches the whole time. Its so entertaining and off the wall hilarious. The characters were so down to earth and moving in more ways than one. The scenes were so lifelike and real you could envision them. My attention was captured by the storyling as it played out. Its so engaging and full of action it kept me on my toes. Pam weaves the words together and brings us, her readers, the besy of th SAY WHAT??? The cover was simple, clearly covering (pun unintended) everything the summary hinted at. It drew me in, as it promised something more than the obvious romantic comedy this book was supposed to be. The summary held my interest because I really had prepared myself to sit and enjoy this genre and not look for logic faults or loopholes or expect any adrenaline rush. The book was a short read. The single sentence that actually begins a wild chase, that went wild beyond all expectations and was a complete laugh riot. Allie is a dog groomer, from a family of successful people (surgeons and lawyers). She's mostly happy and content with what she has but is sick of being treated like a child with her nearest sibling 14 years elder. Allie is the baby of the family, last to know any shocking news, always getting constant reminders for stuff she ought not to forget (like flossing and wearing sunscreen) and the one who gets to sit at the kids' table year after year during family get togethers. She is desperate to prove to her over-achieving family members that she is an adult - a difficult task. She decides to go about this with bringing a 'keeper' home for her parents' 45th anniversary. Once she had set herself this goal, Allie, along with Bree and Megan embark on the quest to find the right man. A lawyer and a high school teacher, Megan and Bree are the perfect mix for the 'girl gang' - funny, goofy, occasional brilliant ideas, a sisterhood spirit and the sense of adventure. They arrive at the erroneous conclusion that a continental breakfast club is the best place to find eligible single men. And with a mistaken identity, all hell breaks loose. What happens after that forms the rest of the story. Does Allie find the man she wanted? Does the search end well for the other two women? A romantic comedy is hard to pull off (or at least according to me) because of two things. Firstly, it seems easy but is actually hard to get the tone of the book right. It has to be breezy, yet not mushy. It has to hold the interest of the reader with other events that are focused on the central theme of romance. Secondly, most often, even the books that begin great veer towards either being tear jerkers with emotional moments (and losing the 'comedy' part of it) or become a continuous series of pathetic gaffes. But Over Easy is the perfect book as far as Rom-Coms go. Light, entertaining, intriguing and the happy ending. The author has managed to keep the tone of the book light, mostly with witty one-liners and self deprecating humour. What could go wrong in a story with three friends on a mission to find the perfect man? Apparently everything. From the word Go, the book is funny, light hearted and while it has some groan worthy moments, is mostly entertaining. The adventures of Allie, Megan and Bree (with something telling the reader that one of them will get their own book, a story with them as the central character, very soon) as they go in search of the men who are best suited to their requirements are written down engagingly. The words though, often have a deeper meaning. Allie has got all the checkboxes for the perfect man - only, the list is something that would satisfy her parents, and not her. While the book clearly outlines that being successful does not only mean dating a good man, it also shows how many young men and women of today have got it all muddled up. The book is, under the surface, a journey of self realisation and has valid lessons for those who want to listen to them. It probably was doubly harder to pull it off with the humour intact, and not sounding preachy. Go pick this one up if you want a light summer read. I finished it in one sitting, but I would of course, remember some words and dialogues from it for some time to come. The overall tone of the book was humorous, with each disaster eliciting a good laugh. The end is a bit too predictable - not really a fault, especially for this genre. A must read for fans of this genre. Those who haven't tried Rom-Coms could start with this book for a good impression and beginning. Adorable book that I couldn’t put down. Love these characters and the interaction. This book is fun! It is witty, clever and laugh-out-loud hilarious at times. The lovable characters and situations they get themselves into are relatable on so many levels that make this book a thoroughly enjoyable read. Dogs, diamonds, young women looking for love in all the right/wrong places with just enough suspense to keep it intriguing. I'm looking forward to reading the next book in the Continental Breakfast Club series--can't wait to see what happens next! To Allie's family, she's the baby; the one that needs to be reminded about basic things, the only member of the family to be deemed 'unsuccessful'. She has her own business, what's unsuccessful about that? Oh, wait, Allie doesn't have the 'successful' husband that her parents so badly want her to have. A continental breakfast, two ladies and 'the ideal man', what could possibly go wrong? Oh my gosh, what can I say! I had absolutely no idea what to expect when I saw the cover of the book. It gave To Allie's family, she's the baby; the one that needs to be reminded about basic things, the only member of the family to be deemed 'unsuccessful'. She has her own business, what's unsuccessful about that? Oh, wait, Allie doesn't have the 'successful' husband that her parents so badly want her to have. A continental breakfast, two ladies and 'the ideal man', what could possibly go wrong? Oh my gosh, what can I say! I had absolutely no idea what to expect when I saw the cover of the book. It gave nothing away which actually made me even more intrigued. I wanted to keep myself guessing so I didn't read the blurb and dived straight into the book. I absolutely ADORED Allie. She is so down to Earth, such fun and a complete ditz (in a nice way). I genuinely felt so sorry for her multiple times throughout the book as she drew the short straw more than once! Luck most certainly wasn't on her side at all, as well as having her family pestering her, I am surprised she didn't turn into the Hulk. I found myself liking all of the main characters actually, which is rare for me haha. Each one had their own sparkle and brought different things to every situation and event within the book. I really liked the diversity Allie and her friends had. None of them were boring at all, so they all stood out. 'Over Easy' is one of those books that reviews will need to be meticulously written due to the amount of spoilers that could be written. Nobody likes spoilers! I am trying to be extra careful. I thoroughly enjoyed this book, more than I thought I would to be honest. The first chapter took me a while to warm up to, but as the story progressed and situations became apparent, I relaxed and enjoyed the story properly. Pamela has written such a fun, tongue in cheek book that gave me the giggles, made me cringe and had me sitting with my head in my hands (multiple times). To create such a varied reaction from one person in regards to a dog groomer, takes talent! Over Easy is an enjoyable read that shows you what NOT to do in terms of trying to please other people. It's also a book that you will want to curl up with, have a bar of chocolate and a cuppa, and just lose yourself in the magic of Pamela's words. I cannot wait to begin the second book in the series! 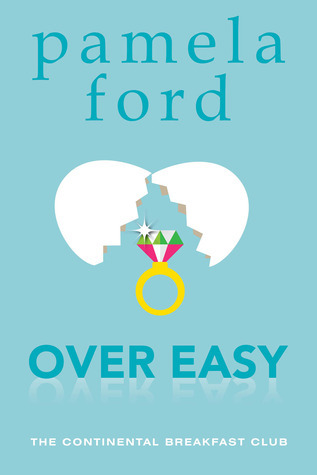 Over Easy by new to me author Pamela Ford was a hilariously laugh-out-loud adventure. The premise of this story is about three best friends who are trying to make love matches. For instance, they joined a gym to try to meet some guys; however that didn’t work out so well. So Megan, the lawyer comes up with an old idea of sneaking into the continental breakfasts at hotels to meet the loves of their lives. And so The Continental Breakfast Club has begun. Over Easy is really Allie’s story and she is Over Easy by new to me author Pamela Ford was a hilariously laugh-out-loud adventure. The premise of this story is about three best friends who are trying to make love matches. For instance, they joined a gym to try to meet some guys; however that didn’t work out so well. So Megan, the lawyer comes up with an old idea of sneaking into the continental breakfasts at hotels to meet the loves of their lives. And so The Continental Breakfast Club has begun. Over Easy is really Allie’s story and she is an owner of a dog grooming business much to the chagrin of her parents, who would like her to finish college and become a veterinarian. Allie is also the baby of the family and is always treated as such not only by her parents, but also her siblings. She not only wants to meet the man of her dreams, but also be able to take him as a date to her parents 45th wedding anniversary, in her own mind proving she is not such a screw up. Let the shenanigans begin. This is a comedy of errors, mishaps, and ridiculous lies. There is mystery and danger as Allie gets more than she bargained for at the first breakfast and she ends up with some rather costly jewels. I liked how all three friends stuck together through thick and thin, the dogs add a nice comical touch, and true love may come out of all this mess for Allie when she wises up and finally decides to tell the truth (however ridiculous and strange it may be). I always enjoy a book that can make me laugh and this one had me roaring. I would consider this a clean read except for the sprinkling of bad language throughout. I believe there are about three instances of the (F) word and there is other crude language as well. That language seemed especially rough for this mostly light hearted comedy. You have been forewarned. I received a copy for an honest review through iRead Book Tours and the opinions are my own. A good looking dog groomer hunting for a potential boyfriend – How hard can that be? Oh it seriously can be quite hard if you pick the wrong guy. That’s exactly what the protagonist, Allie does. Succumbing to the pressure of keeping up with a family of intellectuals, Allie resorts to finding the perfect guy who would fit to her family standards. Along with her friends, Megan and Bree, she sets out to meet men. They initially start off by hitting the gym to find men, but that plan fizzles out. Ev A good looking dog groomer hunting for a potential boyfriend – How hard can that be? Oh it seriously can be quite hard if you pick the wrong guy. That’s exactly what the protagonist, Allie does. Succumbing to the pressure of keeping up with a family of intellectuals, Allie resorts to finding the perfect guy who would fit to her family standards. Along with her friends, Megan and Bree, she sets out to meet men. They initially start off by hitting the gym to find men, but that plan fizzles out. Eventually, they end up visiting a hotel for continental breakfast. Allie finds the perfect guy – Collin who says he is employed with an international jewel merchant. There is, of course, more to than what meets the eye. Not telling if Allie and Collin end up together! From the blurb, I was expecting a light thriller with lots of racing and chase. What I didn't expect was the laughter. Oh my! Almost every scene had me laughing - giggling under my breath or laughing out loud. In short, it was a hilarious read. The characters were finely crafted. They would need to be a certain type to fit into this story. Allie came across as a ditzy person. I think she was more of a child than an adult in her actions. I be I received a free copy in exchange for an honest review. The characters were finely crafted. They would need to be a certain type to fit into this story. Allie came across as a ditzy person. I think she was more of a child than an adult in her actions. I believe she could have been better characterised. But she fit the mould easily. If she hadn't been who she was, the story wouldn't have been a hit with me. Jax was a contradiction of sorts. He seemed responsible at times and silly when concurring with Allie's actions. The side characters especially Bree and Megan were wonderful in their support of Allie. Strong friendships formed the basis of the story. The romance was done with a light hand. I was happy to read a clean romance for once. The comedy part goes without saying. It was a comical plot throughout. There were races and chases - kind of - but not overly serious ones. The story was well done with an unusual premise of trying to find love interests at continental breakfasts. It was interesting enough to get me interested and the way Allie headed into trouble kept me intrigued with the situation. I seriously couldn't understand how she could have disregarded the warning signs. It made for some hysterical scenes and fun. The author showed a deft handling of the plot and had me looking forward to the next scene with delight. The final resolution wasn't up to my expectation but the story ended well for the characters. It left me dissatisfied. I hope Fresh brewed is better in that aspect. Over Easy is the first book in The Continental Breakfast Club series. It's a fun mystery and a quick read. Three friends in their twenties are all single and trying to figure out ways to meet men. I like the three women and how well they complement each other. Allie is a dog groomer, Bree is a teacher, and Megan is a lawyer. They come from completely different backgrounds but they are the best of friends. They have tried several ways to mee I received a free copy of this book for an honest review. Three friends in their twenties are all single and trying to figure out ways to meet men. I like the three women and how well they complement each other. Allie is a dog groomer, Bree is a teacher, and Megan is a lawyer. They come from completely different backgrounds but they are the best of friends. They have tried several ways to meet men already, such as joining a gym, but this time they come up with the Continental Breakfast Club. The idea is to dress like businesswomen and go to the continental breakfast at a nice hotel where there should be plenty of businessmen. The first time Allie and Bree go to a continental breakfast, Allie meets a guy and her life is turned upside down. Unfortunately, it's not because he's "the one." Instead, she is suddenly being stalked and is afraid for her life. I enjoy Pamela Ford's writing. The story is written from Allie's point of view and her thoughts tend to go off into strange places. Once I got used to her wandering thoughts, I enjoyed reading it and wondered where Allie's mind would take her next. Over Easy is a fun, romantic comedy that will take you through some crazy moments and moments of pure joy and throughout it all, Over Easy is one book you just can't put down. Over Easy is so well written, Pamela writes as though you are an active member in the story. As if you are having a conversation with Allie, your best friend, as she relays the story of her life. It made me laugh, made me worried for her and really helped to connect me with her character. The plot is one you have never read Over Easy is a fun, romantic comedy that will take you through some crazy moments and moments of pure joy and throughout it all, Over Easy is one book you just can't put down. The plot is one you have never read before, which I loved! Who would have thought - finding love at the continental breakfast?? But it was this crazy idea that drags Allie and her friends through quite the ordeal! Allie, who can't bear the thought of showing up at a family event without a partner in toe (I think so many of us could relate to this!) decides to follow her friends plan to meet a man at the continental breakfast. The man she meets? A jewel thief! At the time, she has no idea but it is later when she begins to be chased by his contacts that his true identity is revealed and leaves Allie desperate for help. In this time of desperation, a special person steps up to help her. I can't reveal too much but it was an awesome turn of events! Over Easy is a fun, romantic comedy that you will love from start to finish, never wanting to put it down because you just can't wait to see what Allie gets up to next! When I first started reading this I was concerned I'd dislike it because of the possibility it could be like the Bridget Jones books... But it really wasn't. Although the initial story line is about finding "love", the story line that takes over is hysterical (if not ridiculous) and I read the book in two long sessions due to needing to know what was going to happen. I laughed throughout and finished the book with a smile on my face. Allie is a massive drama queen (like me) but has loyal friends When I first started reading this I was concerned I'd dislike it because of the possibility it could be like the Bridget Jones books... But it really wasn't. Allie is a massive drama queen (like me) but has loyal friends that are happy to go along with her drama - regardless of possible consequences. Over Easy also came with its insane plot twists that, despite being hard to believe, kept me engaged and excited about what I was reading. There was a *brief* moment when I just wanted the story to get on with itself, during one of Allie's breakdowns, but overall the book was very well paced and the story was definitely unlike anything I've read before. Such fun. This was a mad dash from beginning to end. Allie comes from a family of over achievers. She’s just a lowly dog groomer. Feeling pressured by her family, Allie, along with her two best friends, come up with a plan to meet the man of her dreams. Surely that will impress her family. They crash the continental breakfast at a fancy hotel and, sure enough, Allie finds a handsome, successful man who shows an interest in her. Sadly, she doesn’t know he’s a jewel thief and has mistaken her for hi Such fun. This was a mad dash from beginning to end. They crash the continental breakfast at a fancy hotel and, sure enough, Allie finds a handsome, successful man who shows an interest in her. Sadly, she doesn’t know he’s a jewel thief and has mistaken her for his contact. Now the sparkly poop is about to hit the fan as the thieves realize they gave the jewels to the wrong person, and they come to collect. I remember how tight I was with my best friends. How we did some really crazy things to help each other. It’s one laugh after another with these three. I was hoping that Allie would find herself. Realize she didn’t have anything to prove to her family. And I hoped her family would realize that too. I couldn’t help but think this madcap adventure would do just that. And maybe, just maybe, Allie would find the right guy for the right reasons. Right from the start, I enjoyed the easy flow of this story. I settled in for the fun and read it straight through, snorting and giggling all the way. A cute, breezy chick lit in the same vein as the Stephanie Plum series. Readers will laugh out loud at the antics of the affable, ditzy, and well intentioned, Allie Parker whose over active imagination can get the better of her sometimes. Allie is sick of being the baby in the family and is determined to bring a man to her parents 45th wedding anniversary. Tired of always being looked down on for being a dog groomer and being single she is determined to turn things around for once and for all. O A cute, breezy chick lit in the same vein as the Stephanie Plum series. Readers will laugh out loud at the antics of the affable, ditzy, and well intentioned, Allie Parker whose over active imagination can get the better of her sometimes. Allie is sick of being the baby in the family and is determined to bring a man to her parents 45th wedding anniversary. Tired of always being looked down on for being a dog groomer and being single she is determined to turn things around for once and for all. One of her friends has a brilliant plan to meet eligible men, they will sneak into swanky hotels and go to their continental breakfasts to meet businessmen. Everything is going well; Allie meets a cute guy and they meet for drinks after work, only things aren't what they seem. He leaves in the middle of the date, sticks her with the bill, and forgets a briefcase. when she realizes whats in the briefcase she understands she's in a world of trouble. How does stuff like this keep happening to her?!? All she wanted was some nice arm candy. Now she's a... jewel thief?!? I flew through this and am in the middle of the second in the series. With fun characters like this, I expect there will be many more books to come! We have heard this before- a big family event is coming and to show up without a date would make one look like a loser, or in this case, like the baby of the family who would never amount to anything of value. Fortunately for Allie, she has two intelligent, single female friends also eager to find male companionship willing to try crazy schemes with her. Over Easy is the first in a series of novels about these three friends and how their choices lead to adventures no one sees coming. After they We have heard this before- a big family event is coming and to show up without a date would make one look like a loser, or in this case, like the baby of the family who would never amount to anything of value. Fortunately for Allie, she has two intelligent, single female friends also eager to find male companionship willing to try crazy schemes with her. Over Easy is the first in a series of novels about these three friends and how their choices lead to adventures no one sees coming. After they fail to find suitable, single men at the gym, Meg comes up with a plan to meet successful businessmen. Allie thinks that is exactly what she has fond until she is ditched on her first date, left "holding the bag." It turns out her date is not the only one who is not who he pretends to be, or who Allie wishes him to be. This very bad date turns into a rollicking adventure Allie is not sure she will survive. At least she has her excellent friends by her side. Full of humor and witty banter, breath stopping moments and lots of confusion, Over Easy is a fast paced escape novel about friendship and growing up. I can't wait to read more by Pamela Ford. This would make a fun Hallmark Channel series. I've heard of women trying various ways of finding husbands, and I've tried a few of those ideas myself (! ), but this one took the cake. A group of friends decide that the best way to meet prospective a prospective husband is to sneak into high-end hotels and eat at the Continental Breakfast buffets! That way, they figured out they would meet men who were smart and obviously doing well enough to live in these hotels. Over Easy is all about Allie, the 'black sheep' of a highly accomplished family, I've heard of women trying various ways of finding husbands, and I've tried a few of those ideas myself (! ), but this one took the cake. A group of friends decide that the best way to meet prospective a prospective husband is to sneak into high-end hotels and eat at the Continental Breakfast buffets! That way, they figured out they would meet men who were smart and obviously doing well enough to live in these hotels. Over Easy is all about Allie, the 'black sheep' of a highly accomplished family, who has settled to run a pet grooming service. In her quest to find a guy presentable enough to take to her parents' anniversary party, she ends up getting into a lot of trouble. How she, with the help of her friends and a new client attempt to get her out of this mess and solve the crime makes a fantastic read. Suspense, comedy and romance make a great package and Pamela Ford has won a new fan! I enjoyed the book so much that I just had to read the next in the series. My review of Freshly Brewed will follow soon. What a wonderful read! I really enjoy the story and how the author brought the characters to life. The characters were likable and relatable. I can relate to the struggle Allie had with her family. Family expectations of you can become pretty overwhelming overtime. Don't get me wrong I love my family but sometimes I feel restricted. They support me and love me but I know they wish I do something else. I'm sure that's how Allie had felt with her family. And I liked her enthusiasm in trying to pro What a wonderful read! I really enjoy the story and how the author brought the characters to life. The characters were likable and relatable. I can relate to the struggle Allie had with her family. Family expectations of you can become pretty overwhelming overtime. Don't get me wrong I love my family but sometimes I feel restricted. They support me and love me but I know they wish I do something else. I'm sure that's how Allie had felt with her family. And I liked her enthusiasm in trying to prove her family wrong about her choice in career. I am not usually the one to read contemporary stories but this one was a nice surprise. At first I didn't really thought of anything special about the book but it ended up being one of my favorites. It was such a delight to read this story. The pace of the story was good. It was easy to follow along and it wasn't all over the place. I had a blast reading this story and finished it in one sitting. The story gave me such fuzzy feelings all through out and I can't help but smile. Over Easy was such a delightful read! Calamities and misadventures follow Allie and her friends wherever they go throughout this laugh out loud book. Part mystery, part chic lit, part suspense, part romance, The Continental Breakfast Club is sure to please anyone who love fun, quirky characters! Over Easy is also a fun read for dog-lovers. Allie is a dog-groomer, and her dogs play a key role in the story. I love reading stories that have tight girlfriends working together, and this story definite Over Easy was such a delightful read! Calamities and misadventures follow Allie and her friends wherever they go throughout this laugh out loud book. Part mystery, part chic lit, part suspense, part romance, The Continental Breakfast Club is sure to please anyone who love fun, quirky characters! Over Easy is also a fun read for dog-lovers. Allie is a dog-groomer, and her dogs play a key role in the story. I love that Over Easy is Disclaimer: I received a complimentary copy of Over Easy by Pamela Ford for the purpose of an honest review. What a charming contemporary story! Over Easy, by Pamela Ford, is wonderful blend of romance and suspense! I really enjoyed it, her three characters Allie, Megan and Bree are so charming and funny! It tells the story of three best friends who concoct a plan, to help them find the men of their dreams. So they decide to try and meet them at continental breakfast clubs, unaware that thieves are lurking around! Will they find their future husbands? As one of them, get dangerously mixed in a diamond t What a charming contemporary story! It tells the story of three best friends who concoct a plan, to help them find the men of their dreams. So they decide to try and meet them at continental breakfast clubs, unaware that thieves are lurking around! Will they find their future husbands? As one of them, get dangerously mixed in a diamond theft, they, will have to find another way to meet them. What will happen next? Watch for Allie, Megan and Bree's next search of “the perfect husband” in Fresh Brewed! This story was fun to read, well written, with a touch of suspense! Allie is tired of being treated like the baby of the family she is. She decides that if she finds the right man they will treat her more like an adult. Her friends come up with the idea of meeting men at hotels at Continental breakfasts. Allie is all for the idea and borrows her successful sister's clothes because she can't go dressed as a dog groomer. All things seem to be going well when she meets a guy that she thinks fits the bill and you are drawn into an adventure where not everything is a Allie is tired of being treated like the baby of the family she is. She decides that if she finds the right man they will treat her more like an adult. Her friends come up with the idea of meeting men at hotels at Continental breakfasts. Allie is all for the idea and borrows her successful sister's clothes because she can't go dressed as a dog groomer. All things seem to be going well when she meets a guy that she thinks fits the bill and you are drawn into an adventure where not everything is at it seems. In an Oyster Shell - This was a heart-warming laugh out loud read. I highly recommend it. Pamela Ford!!! Top notch author. Who couldn't love a story with dogs and diamonds. Fast pace and hilarious, Over Easy is the first book in a series called the Continental Breakfast Club. The story is about a dog groomer who wants to meet a well connected guy by sneaking into a continental breakfast. Does she meet the guy? Yep, and so much more...a jewel heist, mistaken identities and possibly murder wait for you in this book. Read it! You won't be disappointed. Can't wait for book two!!! A fun, zany read with a series of miscommunications and misunderstandings a mile long. Allie, and her friends set out to meet single men at a local hotel continental breakfast. What she doesn't expect is to get swept up with a case of stolen jewelry. This is a fun book. Allie is a little naive at times, but I could actually see this as a Hallmark or Lifetime movie... And I mean that as a compliment. Allie and her friends are in for a wild ride. This was such a fun read! Fresh characters, setting, and lots of dogs. I will admit that it seems a little slow to begin, but once the action starts you have to hold onto your hat, it doesn't slow down until the end. I loved the writing and the characters so much, I can't wait to read the next one in the Breakfast Club Series!